Evanston artist Melissa Blount. Blount hosted a quilt making circle to honor the lives of black women and girls lost to interpersonal violence. Evanston artist Melissa Blount held a quilt-making session Wednesday to honor the lives of black women and girls lost to interpersonal violence. Held at the Segal Visitors Center with over 100 in attendance, the event also featured Blount’s “Black Lives Matter Witness Quilt,” a project that engaged community members to highlight the pervasiveness of interpersonal violence — violence against spouses, partners or family members — and its connection to institutionalized state violence. 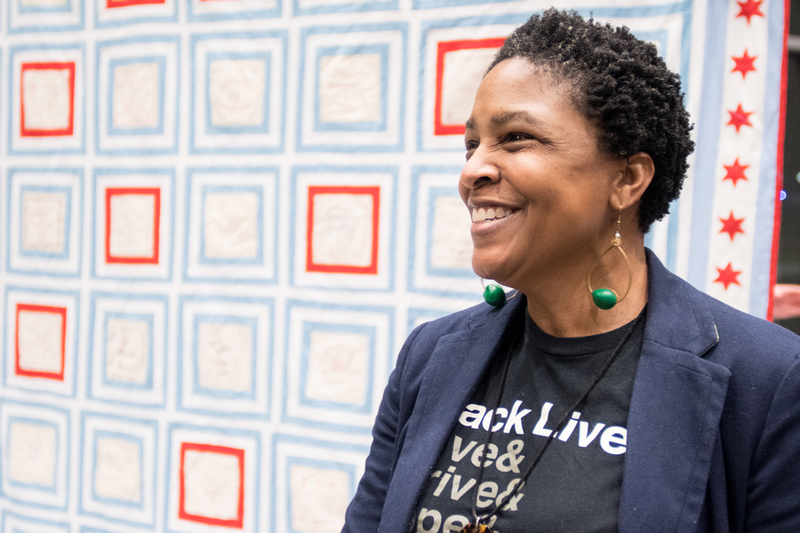 Following a reception at the Block Museum of Art, Blount spoke about her art at the visitors center, where community members engaged in discussion and stitched patches themselves, which when completed, will eventually be stitched together to create a new quilt. 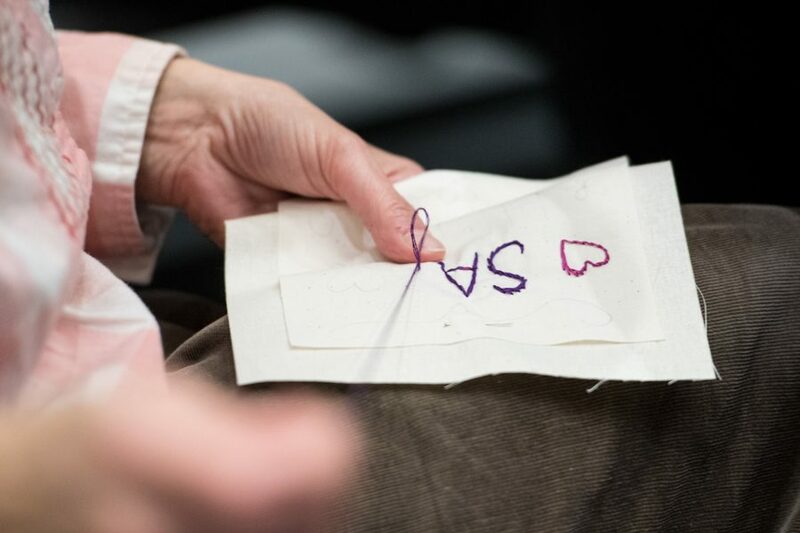 Many participants embroidered the words “Say Her Name” to commemorate the lives of women lost to violence. Blount said she hopes her work will further the interests of the Black Lives Matter movement, which she said experiences polarization and misrepresentation, especially through the media. Trauma caused by white supremacy exists not only nationally, Blount said, but within Evanston as well. Although originally from Detroit, Blount said she also sees similar issues of inequity in Evanston. But, she said, Evanston residents are willing to discuss issues affecting the community and take action against inequity. A participant sews a patch that will be later incorporated into a new quilt. About 100 people attended the event. Just as the “Black Lives Matter Witness Quilt” seeks to memorialize women and girls who were murdered by their abusers, Blount said her next project aims to bear witness to the women and girls incarcerated for killing their abusers. Melissa Blount said her husband, Ben Blount, inspired her to make the quilt after she was unsure how to begin. After her husband, an artist focused on design and printing, completed a project that documents the lives of black men and boys, she said she realized that she could do the same for black women and girls. Ben Blount said though her quilt is a piece of art, its main purpose is fostering conversation and building community. Medill junior Maddy Ashmun told The Daily she enjoyed seeing women from different backgrounds show up to commemorate women lost to interpersonal violence.